Gary Moore's stable made up for of the disappointment of Sire De Grugy unseating his rider in the Betfair Price Rush Chase when 20/1 shot Violet Dancer landed Britain's richest handicap hurdle, the £155,000 Grade Three Betfair Hurdle. Partnered by the trainer's youngest son Josh, the five-year-old was left in the lead at the fourth flight and never saw another horse for the remainder of the contest, coming home three lengths clear of Cheltenian. This was a third Betfair Hurdle victory for the Moore stable, following the victories of Heathcote (2007) and Wingman (2008). Gary Moore said:"It's the craziest day that I have ever come across. I had three runners in the first and none of them ran well. One bust its pelvis, so that starts the day off great and then Sire De Grugy gets rid of Jamie and this horse goes and wins this. "Jamie won't be very happy because he was in limbo which horse to ride. I think he made the choice in the end but Josh is a very, very good rider. Fair play to Hayley, she has done a lot of schooling with him and his jumping is a lot better. "He has jumped so much better today and has probably had a fairly easy lead in front. Halfway round, I thought 'Josh, why are you going so fast?' but he obviously got it right again. "Sire De Grugy is fine. He trotted up for the vet and he was quite happy with the horse. 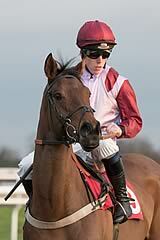 We live to fight another day and hopefully we can get him back right for Cheltenham. That's a one-off thing - horses are entitled to fall once in their career and we hope that he doesn't do it again." Josh Moore said: "He felt great the whole way. We did a standing start and I wanted to be handy - I didn't want to miss it - and, all of a sudden, he has gone and I am the only one there upsides James Reveley. "I had a nice lead and it's the best that he has jumped because he had a clear sight of his hurdles. I was always able just to sit on him and it helps at the end of it. "It has been a quiet year and Sire De Grugy was a bit unfortunate in the race before and you always need a big winner, especially in a race like this. Dad always does well with his handicap hurdlers and he built his reputation a little bit on it. The horse has come here in great form. "I have Hayley (his sister) and Jamie (brother) to thank. Jamie was kind enough to let me ride this horse and Hayley has been riding him out on his own at home which has really helped him. "We thought he had a big handicap hurdle in him. We were fortunate in running but you have got to have the look in these races. "There was lots of trouble in behind but I couldn't hear anything. My only worry was whether there had been a false start as it was so quiet! "This is the biggest win of my career so far."